Custom Printed Sun Ray Mirror Sunglasses are the best choice if you are trying to make a big brand impression through a party or celebration. These custom party sunglasses will make sure that all your invitees will see your brand logo or product name throughout the event, thus improving the publicity of an exclusive product or service quickly. With a size of 6" H X 0.5" W, these custom printed sunglasses are coming in 6 solid colors and have multiple colors of UV400 protective mirrored lenses. Order now to grab our free artwork design and free online proofs facilities. 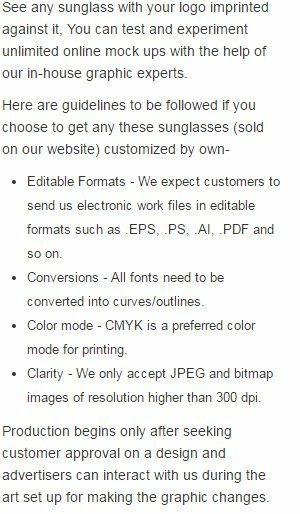 Request a quote to know the value savings that you can avail on bulk orders of Custom Printed Sun Ray Mirror Sunglasses.